A certified computer instructor with project management experience in web development. 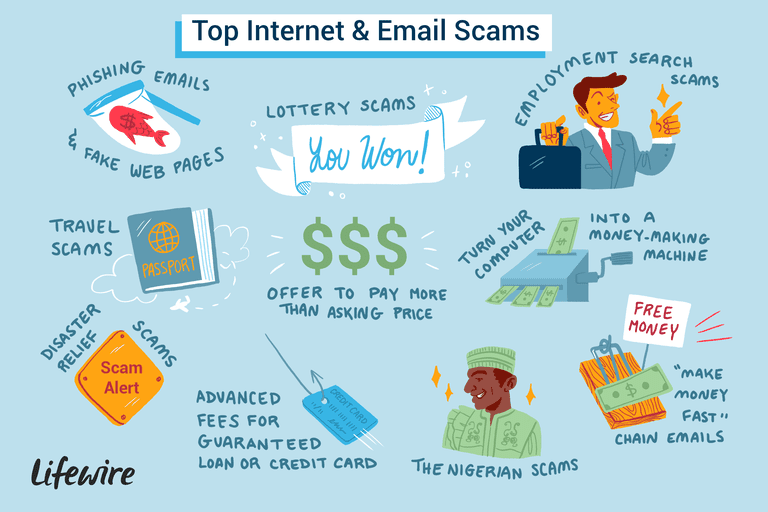 Internet scams have been around nearly as long as the internet itself, and many of them have roots in scams that existed well before the internet but have been adapted to the new medium. Scams have become more advanced, more deceptive, and more common, and even venerable scams from the early days still snag people. Unfortunately, malware protection software doesn't help much with many of these types of scams, because they rely on tricking the user, not delivering malicious software. So, being aware of the common scams can help you avoid them. Email programs have improved by adding ways of recognizing bogus emails and flagging them before they get to you, but they're not perfect. The best way to avoid falling prey to a scam is to know what they look like. Below are some of the more common ones you may encounter — or may have already encountered. This is the most widespread internet and email scam today. A "phishing" email lures you into divulging your login credentials — your username and password — through convincing emails and links to web pages. These phishing emails and fake websites that resemble legitimate credit authorities like Citibank, eBay, or PayPal. The emails frighten or entice you into clicking on a link that delivers you to the phony web page, where you can enter your ID and password. A common ruse is an urgent need to "confirm your identity." The message will even offer you a story of how your account has been attacked by hackers to trick you into divulging your confidential information. Be wary of clicking links in emails. Check a link's legitimacy by checking that the URL address of the link is sending you to a secure site — you'll know this because the link address will begin with https:// (note the "s" after http). Phishing fakes will often just have http:// (no “s”). Also, look at the domain of the URL address. Is it sending you to a legitimate domain owned by the institution? A lot of times the URL is not to the institution's official site domain. If still in doubt, make a phone call to the financial institution to verify if the email is real. In the meantime, if an email seems suspicious to you, do not trust it. Click nothing on it. Being skeptical could save you a lot of money, time, and hassle. Most of you have received an email from a member of a Nigerian family with wealth. It is a desperate cry for help in getting a very large sum of money out of the country. A common variation is a woman in Africa who claimed that her husband had died and that she wanted to leave millions of dollars of his estate to a good church. This is known as the Nigerian scam, and also as the "4-1-9" (which refers to the section of Nigerian Criminal Code that deals with fraud) and the "Advance Fee Scam." In every variation, the scammer is promising obscenely large payments for small unskilled tasks. This scam, like most scams, is too good to be true, yet people still fall for this money transfer con game. They will use your emotions and willingness to help against you. They will promise you a large cut of their business or family fortune. All you are asked to do is cover the endless “legal” and other “fees” that must be paid to the people that can release the fictional fortune. The more you pay, the more they will scam out of you. You will never see any of the promised money because there isn’t any. This scam is not even new; its variant dates back to 1920s when it was known as "The Spanish Prisoner" con. To avoid this scam, ignore it and delete the email. Most of us dream of hitting it big in a lottery, quitting our jobs, and retiring while still young enough to enjoy the finer things in life. Chances are you will receive at least one intriguing email from someone saying that you did indeed win a huge amount of money. The seductive visions of wealth can make you overlook that you never even entered this lottery. This scam will usually come in the form of a conventional email message. It informs you that you have won millions of dollars, and it flatters you with congratulations repeatedly. The catch: Before you can collect your winnings, you must pay the “processing fee" which can be upwards of several thousands of dollars. The moment the bad guy cashes your money order, you lose. Usually, by the time you realize you have been suckered by a con artist, they are long gone with your money. Avoid this scam by ignoring it and deleting the email. If you are thinking about applying for a “pre-approved” loan or a credit card that charges an upfront fee, ask yourself: “Why would a bank do that?” These scams are obvious to people who take the time to scrutinize the offer. Reputable credit card companies may charge an annual fee, but it is never charged upfront (again, why on Earth would they? It's more lucrative to apply the fee to your credit balance and potentially collect interest on it!). As for incredible pre-approved loans for half-a-million dollar homes: Use your common sense. These people do not know you or your credit situation, yet they are willing to offer massive credit limits? Not a chance. Sadly, far too many victims are pressured by financial problems and are susceptible to this con. If only one in every thousand people falls for this scam, the scammers have won. Avoid this one by never paying an upfront fee for credit or loans. This one involves an item you might have listed for sale such as a car, truck, or some other expensive item. The scammer finds your ad and sends you an email offering to pay much more than your asking price. The reason for overpayment is supposedly related to the international fees to ship the car overseas. In return, you are to send him the car and the cash for the difference. The money order you receive looks real so you deposit it into your account. In a couple of days or the time it takes to clear, your bank informs you the money order was fake and demands you pay that amount back immediately. In most documented versions of this money order scam, the money order was indeed an authentic document, but it was never authorized by the bank it was stolen from. In the case of cashier's checks, it is usually a convincing forgery. The results are devastating — you have lost the car, the cash you sent with the car, and you owe a hefty sum of money to your bank (and potentially fees) to cover the bad money order or the fake cashier's check. Avoid this scam by being incredulous — if it's too good to be true, like someone offering to pay you more than you ask for something, it probably is. You have posted your resume, with at least some personal data accessible by potential employers, on a legitimate employment site. You receive a job offer to become a "financial representative" of an overseas company you have never even heard of before. The reason they want to hire you is that this company has problems accepting money from US customers and they need you to handle those payments. You will be paid a percentage commission per transaction. Soon you will owe money to your bank because the checks or money orders were fake. What do 9-11, the Tohoku Tsunami, and Katrina have in common? These are disasters in which people died or lost everything. In times like these, good people pull together to help the survivors, including through online donations. Enter the scammer, who sets up fake charity websites to steal money donated to the victims of disasters. If your request for the donation came via email, there is a chance it is a phishing attempt. Do not click on any links in the email or provide any bank account or credit card information. You can avoid this scam and still help those in need by contacting recognized charitable organizations directly by phone or through their websites that you navigate to directly (and not through an email link!). These scams are most active during the summer months. You receive an email with the offer to get amazingly low fares to some exotic destination, but you must book it today or the offer expires that evening. If you call, you’ll find out the travel is free but the hotel rates are highly overpriced. Some can offer you rock-bottom prices but hide certain high fees until you “sign on the dotted line.” Others, in order to give you the freebie, will make you sit through a timeshare pitch at the destination. Still, others may just take your money and deliver nothing. Getting a refund, should you decide to cancel, is usually impossible. Your best strategy is to book your trip in person, through a reputable travel agency or proven legitimate online service like Travelocity or Expedia. A classic pyramid scheme: You receive an email with a list of names and are asked to send 5 dollars (or so) by mail to the person whose name is at the top of the list, add your own name to the bottom, and forward the updated list to a number of other people. The author of this scam letter painstakingly explains that, if more and more people join this chain, when it’s your turn to receive the money, you might even become a millionaire! Bear in mind that, most times, the list of names is manipulated to keep the top name (the creator of the scam, or his friends) on top, permanently. As with the previously circulating snail-mail version of this chain, the email edition is just as illegal. Should you choose to participate, you risk being charged with fraud — definitely not something you want on your record or resume. "Turn Your Computer Into a Money-Making Machine!" Although not precisely a scam like the others on this list, this scheme is deceptive and dangerous. It works like this: You can turn your computer into a money-making machine, just like thousands of other now-rich people have done. Just send money for instructions on how to download and install a program on your computer that will indeed turn it into a money-making machine…for spammers. At sign-up, you get a unique ID and you have to give them your PayPal account information for the “big money” deposits you’ll get “soon.” The program that you are supposed to run, sometimes 24/7, opens multiple ad windows, repeatedly, thus generating per-click revenue for spammers. This is just bad business, so don't get seduced into trying it. Installing dubious programs on your system is a foundational computer no-no. You potentially introduce all sorts of dangerous malware to your system that will erode your system's performance, potentially turn your computer into a zombie bot for hackers to exploit or allow malicious elements to access your system and private information with impunity. Can You Spot a Scam Site From a Real One? When You See The Dark Side Of Clickbait, You'll Freak Out! Should You Be Using Venmo for Mobile Payments?